Dr. Alfred Frohlich from the University of Vienna first began to unravel the neuro-hormonal basis of obesity in 1890. He described a young boy with the sudden onset of obesity who was eventually diagnosed with a lesion in the hypothalamus area of the brain. It would be later confirmed that hypothalamic damage resulted in intractable weight gain in humans, establishing this region as a key regulator of energy balance. In rats and other animals, hypothalamic injury could experimentally produce insatiable appetites and induce obesity. But, researchers quickly noticed something else, too. All these obese animals shared characteristic liver damage, which was occasionally severe enough progress to complete destruction. Looking back at hereditarily obese strains of mice, they noted the same liver changes. Strange, they thought. What does the liver have to do with obesity? Dr. Samuel Zelman first made the connection between liver disease and obesity in 1952. He observed fatty liver disease in a hospital aide who drank in excess of twenty bottles of Coca-Cola daily. This was already a well-known complication of alcoholism, but this patient did not drink alcohol. That obesity could cause similar liver damage by itself was completely unknown at that time. Zelman, aware of the animal data, spent the next few years tracking down twenty other obese, non-alcoholic patients with evidence of liver disease. One oddity he noted was that they unanimously preferred carbohydrate rich diets. It would be almost thirty years later, in 1980, that Dr. Ludwig and colleagues at the Mayo Clinic described their own experience. 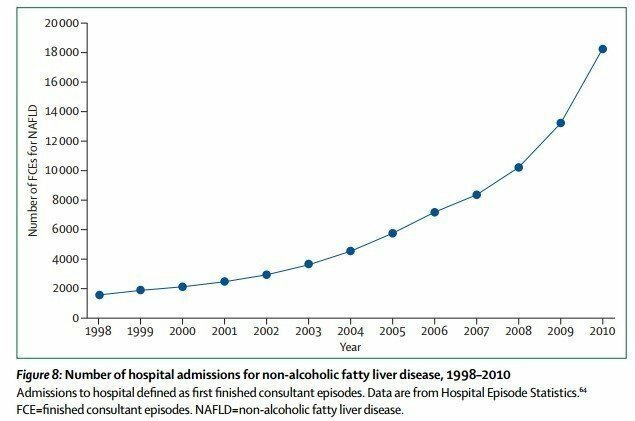 Twenty patients had developed fatty liver disease, similar to what is found in alcoholics but they did not drink alcohol. This ‘hitherto unnamed disease’ was termed Non-Alcoholic Steatohepatitis (NASH), by which it is still known today. Once again, the patients were all clinically linked by the presence of obesity and obesity-associated diseases such as diabetes. Other than enlarged livers, there was also varying evidence of liver damage. 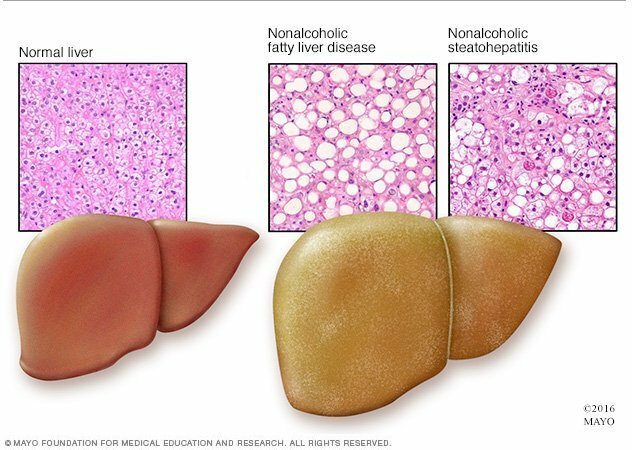 When fatty infiltration is obvious, but without evidence of liver damage, the term Non-Alcoholic Fatty Liver Disease (NAFLD) is used. This discovery, at the very minimum, saved patients from their doctor’s repeated accusations that they were lying about their alcohol intake. Dr. Ludwig wrote that it spared doctors “the embarrassment (or worse) that may result from the ensuing verbal exchanges.” Some things in life never change. Today, when patients have difficulty losing weight on an ‘Eat Less, Move More’ diet, doctors accuse patients about cheating, rather than accept the bitter fact that this diet simply does not work. This age-old game is called “Blame the Victim”. 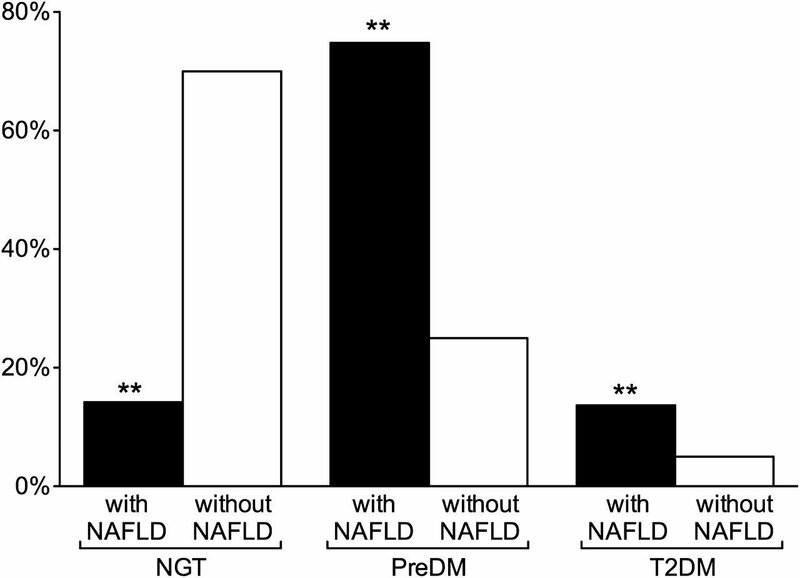 With the new recognition of NAFLD, research confirmed the extraordinarily close association between obesity, insulin resistance and fatty liver. Obese individuals have five to fifteen times the rate of fatty liver. Up to 85% of type 2 diabetics have fatty liver. Even without the diabetes, those with insulin resistance alone have higher levels of liver fat. These three diseases clearly clustered together. Where you found one, you almost invariable found the others. Hepatic steatosis – the deposition of fat in the liver where it should not be, is consistently one of the most important markers of insulin resistance. The degree of insulin resistance is directly related to the amount of fat in the liver. Rising alanine transaminase levels, a blood marker of liver damage, in obese children are directly linked to insulin resistance and the development of type 2 diabetes. Even independent of obesity, severity of fatty liver correlates to pre-diabetes, insulin resistance and impairment of beta cell function. The incidence of NAFLD in both children and adults has been rising at an alarming rate. It is the commonest causes of abnormal liver enzymes and chronic liver disease in the Western world. NAFLD is estimated to affect at least 2/3 of those with obesity. The news is even worse for NASH. It is estimated that NASH will become the leading cause of cirrhosis in the Western world. It has already become a leading indication for liver transplant and will likely become the undisputed leader within a decade. In North America, the prevalence of NASH is estimated at 23%. This is a truly frightening epidemic. In the space of a single generation, this disease went from being completely unknown, with even a name, to the commonest cause of liver disease in the North America. From virtual unknown to world heavyweight champion of the world, this is the Rocky Balbao of liver diseases. The liver lies at the nexus of food energy storage and production. After absorption through the intestines, nutrients are delivered directly through the portal circulation to the liver. Since body fat is essentially a method of food energy storage, it is little wonder that diseases of fat storage involve the liver intimately. Insulin pushes glucose into the liver cell, gradually filling it up. The liver turns on DNL to convert this excess glucose to fat, the storage form of food energy. Too much glucose, and too much insulin, over too long a period of time leads eventually to fatty liver. Fatty liver causes insulin resistance. Insulin resistance leads to compensatory hyperinsulinemia. Hyperinsulinemia causes insulin resistance, and is the initial trigger for this vicious cycle. Fatty liver is clearly associated at all stages from mere insulin resistance to pre-diabetes to full blown diabetes, even independent of overall obesity. This relationship holds in all ethnicities, whether Asian, Caucasian or African-American. The crucial piece necessary for development of insulin resistance is not overall obesity, but fat contained within the liver, where there should not be any. This is the reason that there are underweight patients, as defined by the Body Mass Index, who still suffer from type 2 diabetes. These patients are often termed “skinny diabetics” or TOFI (Thin on the Outside, Fat on the Inside). Overall weight matters less than the fat carried around the midsection and the liver. This central obesity, rather than generalized obesity is characteristic of the metabolic syndrome and type 2 diabetes. Fat carried under the skin, called subcutaneous fat, contributes to overall weight and BMI but seems to have minimal health consequences. It is cosmetically undesirable, but seems to be otherwise metabolically innocuous. This is easily demonstrated by metabolic studies of liposuction, the most common surgical procedure done under anesthesia in the United States. Over 400,000 procedures are performed annually. The surgical removal of large amounts of subcutaneous fat reduces body weight, BMI, waist circumference and the hormone leptin decreases. However, metabolic parameters are not improved even with the removal of ten kilograms (22 pounds) of subcutaneous fat. There are no measurable benefits in blood glucose, insulin resistance, inflammatory markers or lipid profiles. This lack of benefit occurs despite similar levels of fat loss compared to most dietary weight loss programs. By contrast, weight loss through dietary intervention often result in marked improvement in all metabolic parameters. Conventional weight loss methods reduce subcutaneous fat, visceral fat, and intra hepatic fat whereas liposuction only removes subcutaneous fat. Visceral fat is a far superior predictor of diabetes, dyslipidemia and heart disease compared to overall obesity. But a difference still exists between fat within the organ and fat around the organs (omental fat). Direct surgical removal of omental fat also carries no metabolic benefits. The development of fatty liver is a crucial stepping-stone to elevated insulin resistance, the essential problem of type 2 diabetes. With sufficient glucose available as substrate, insulin drives new fat production and ultimately fatty liver. Insulin tries vainly to move more glucose into the overflowing liver cell without much success, much like the overflowing subway train. This is insulin resistance in the liver. Fat contained within the organs is other than the liver also plays a leading role in disease. Little fat is normally contained directly within organs, and this abnormality causes most of the complications of obesity (18). This includes the fat contained within the liver, but as we shall see later, also the fat contained with the skeletal muscles and pancreas. Fatty liver precedes the diabetes diagnosis often by ten years or more. The emergence of the metabolic syndrome follows a consistent sequence. Weight gain, even as little as 2 kilograms (4.4 pounds) is the first detectable abnormality, followed by low HDL cholesterol levels. High blood pressure, fatty liver, and high triglycerides emerge next, at roughly the same time. The very last symptom to appear was the high blood sugars. This is a late finding in metabolic syndrome. 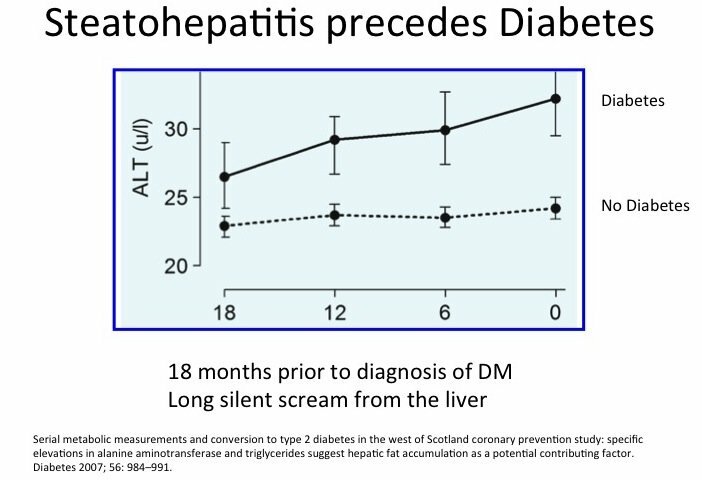 The West of Scotland study confirmed that fatty liver and elevated triglycerides precedes the diagnosis of type 2 diabetes by at least 18 months. The triglyceride level increased more than 6 months before the diagnosis. This is strong evidence that accumulation of liver fat is crucial to the development of insulin resistance, but also may act as a trigger for the development of type 2 diabetes. While virtually all patients with insulin resistance have fatty liver, the opposite is not true. Only a minority of patients with fatty liver have full-blown metabolic syndrome. This suggests that fatty liver is the precursor to insulin resistance, consistent with the overflow paradigm. Over decades, chronic excess insulin leads to accumulation of more and more liver fat, which now resists further glucose influx. The overfilled, fatty liver creates insulin resistance. In type 2 diabetic patients, there is a close correlation between the amount of liver fat and the insulin dose required reflecting greater insulin resistance. In short, the fattier the liver, the higher the insulin resistance. By contrast, in type 1 diabetes, insulin levels are extremely low, and liver fat is lower than normal. This is strong evidence that insulin levels are a key causal factor in developing fatty liver. Insulin drives fat production in the liver and low levels of insulin lead to less fat in the liver. Dear Dr jason could you please send me an IDM by arabic ? Try copying the article and paste into a translator. Do you know about this facebook group? https://www.facebook.com/groups/1867842883447030/?hc_location=ufi Arabic LCHF group! And fasting breaks this vicious cycle. Thanks for your work, Dr. Fung…and thanks for your videos, books and blogs. I have learned so much: life changing lessons. You are reaping massive amounts of good karma ? To reverse this fatty liver and insulin resistance and T2 diabetes, I am assuming from this article that one must lose weight by dieting. I am obese with T2 diabetes going on 10 years. I need more information on reversing this horrible disease with diet. Am adopting a LCHF diet and trying to be more active. Never had a weight problem until the last 20 years and now weigh in the 290s for 5’7″. Age 68. I am looking to heal myself. Weight kept creeping up as I used more insulin. Any diet advice would be welcomed. Thank you. Steve, HFCS is toxic, but so is regular table sugar. Why not mention that, too? Wheat is bad, but so are other grains and starches for T2DM. Anne, you are making the right choice going with LCHF. You might want to check out dietdoctor.com for recommendations. 1) Modern Wheat contains proteins (gliadin,etc.) that stimulate appetite and wreak havoc on the intestinal system. Corn/rice/etc. have similar problems, but not to the level of wheat. They should all go, but knowing that people need to transition, it sometimes is necessary to do these things in stages. 2) HFCS goes straight to the liver and wreaks havoc metabolically. Table sugar does not. That’s why eliminate those two immediately. From what I understand, it is specifically the fructose component that is the bad guy for the liver. HFCS is 55% fructose and 45% glucose. Table sugar on the other hand is a 50/50 mixture. Based on that, I would say that table sugar is only a small bit less harmful than the HFCS. I try to minimize both in my diet. Anne ~ you can reverse this disease. Please read all the free advice that Dr. Fung has given us on this blog. Please go to dietdoctor.com for help with recipes and how to eat a LCHF diet. Everything you need to know is in this blog. This is completely reversible. For me the key to weight loss and kicking T2D was Intermittent Fasting. There’s plenty of guidance in Dr Fung’s blogs for that. I enrolled in their long-distance (I’m in New Zealand) program and felt it was well worth it. Hope it’s okay to post this comment. Join the “Reversing Diabetes” group on facebook. Some of our members are in Dr Fung’s distance program. We use the LCHF diet to reverse high blood sugar and we agree with Dr. Fung and use his videos and the info from Dr Eric Westman and Dr Sarah Hallberg who are also well known in this area. Terry, how did you space out your 5 day fasts? Did you do more than one a month? Did you just eat healthy inbetween and not worry about lchf? I’m new to intermittent fasting and trying to decide how to space fasts. Thanks for your time. This is the must watch presentation by Dr Roy Taylor. I did this, not with Optifast or Slimfast but by using MyFitnessPal and trying to drop 2-3 lbs/week. Also, get Dr Michael Mosley’s book 8 week blood sugar diet. Whether you do it in 8 weeks or 52 weeks, you have to want to do it and stick with it. First obstacle…will power or lack thereof. I also enjoyed Dr Mosley’s 8 week blood sugar diet, and am presently doing that eating OMAD late afternoon. Thanks for the presentation link, will watch this afternoon. Huge fan of Dr Jason Fung who tirelessly gives such good and free information. Dr Fung considered the 8 Week Blood Sugar Diet one of the ‘best books of the year’. I sure missed your blog posts the past few weeks. I so enjoy and look forward to reading more every week and hope you continue your work for many years yet. Fast and Feast then rinse and repeat. Is there a commonly available test for fatty liver? Something we could ask our physician to order. Thanks. If you are genuinely concerned ask for the combination of liver function tests (blood tests) and ultrasound of the liver, which should be sensitive enough to diagnose. Having said that, the management will be the same. Dietary changes and weight loss. What units are used to report those lab tests in Europe ? I can calculate the equivalent in US units. I am wondering if the cutoff a are different here. Assuming those are the same tests you refer to Phillip. AST/SGPT units/L normal range 21-73 (not 53). As the above disagrees with what I find via google I do see the range is relative to the protocol used. On my test results it give the normal range as I did above, ymmv. While those are the “normal” ranges, realize that many “normal” Americans have some degree of fatty liver. I personally like to see them “below halfway to the top of the range” to be fully reassured. I got a gut reaction here–what you say may be true–but I think in the least: you are only seeing a snap shot of the big picture and at best: other refined carbs are for sure adding fuel to the fire. Also–there may not be as much obesity, but are they TOFis? Check back in 20 years. the Japanese consume 57 grams of sugar per day, not 14. People eat fewer than 25 grams of sugar in only 10 countries. This is so reasonable and easy to understand. Thank you. I wonder why fatty liver often is indicated first(?) on the outside by larger belly. And is fatty liver = enlarged liver ? The liver is attached under the rib cage, high up in the abdominal cavity. Is it that an enlarged liver necessarily is pushing the rest of the organs down, this way causing the larger belly ? How much larger/heavier can a DB-2 liver on a very obese 65 year old man taking insulin daily be ? Compare to “normal” size. I’m wondering if there is a way to detect fatty liver? If so, it can be used as a preventative screening just like smear testing for cervical cancers. Infant, it could even be used to monitor the progress of treatment. Treatment is progressing well as fat reduces around the liver. Ultrasound, liver panel tests including GGT. But simplest is waste circumference larger than half body length…. Eye whites becoming whiter is a side effect of higher fat intake I noticed! More dietary fats means more bile with more toxins flushed out early from the liver…. Thank you for such a wonderful article once again. I seriously think that you must be recognised and awarded with NOBLE PRIZE for starting a new way of eradicating the most horrific and pandemic disease: T2D. Your work is same as any other scientists work who invent drugs to eradicate disease causing bacteria or viruses. Same way you’re devising new ways to end this Pandemic with your “medicine”, even better “Medicine: without any drugs”. Hoping and waiting for your article on Underweight and normal weight lean T2D patients. I agree wholeheartedly! How do we nominate him?! I wish they open their eyes to new ways of treatment rather than bookish and “Pouring the chemicals into your body” methodologies. Until then, I think they are deaf. I’ll be sure to ask about my liver function numbers at next Dr visit. Is there an ideal range to look for (US measurements)? I third Terry and Sten. It took me a year to get really comfortable, as I as winding down consumption of carbs. But then fasting became easy. Patience grasshoppers, I now have the fasting insulin of a caveman and ideal BMI but it took time. Deb, a lot of doctors know they are doing diabetics no good, but their hands are tied because they feel like they can’t go against the Diabetes Association recommendations. DAA recs are heavily influenced by the pharma and processed food industries. It’s a perfect storm that makes and keeps people sick. I share your frustration. So I’m stuck being a ticking time bomb? An ultrasound revealed that I have mild fatty liver disease after my liver enzymes were elevated for no apparent reason ( I went to the doctor for persistent nausea). I’m wondering what I can do about it. I’m a 5’4″ 155lb non-diabetic who has tried intermittent fasting and the LCHF diet for weight control and energy boosts. Any suggestions are welcome. Doesn’t sound like you are in terrible shape. Probably need around 20 lb weight loss to get bmi down to 23, and also measure your waist as well. Of course low carb diet, smaller meals and strict fasts will help. You can get a little nausea with this, but persistent is not normal. Any other symptoms? If it persists insist that your doctor does more workup, you don’t want to miss something. Continue with fasting IF and LCHF, it might take longer than you would like, but you should get there if you persist. Maybe you need longer IF, or more often, or you just need to persist. Read more on the blog, and carry on. It took about a month for me to lose 10 lbs and my recently diagnosed fatty liver went away. My doc said that the first weight you lose comes mostly from the liver so it only takes as long as it takes to lose the first 10 or 20 lbs to see a difference in your liver enzymes. Is it possible some people are genetically predisposed to this condition….3 out my 4 grandparents had fatty liver and I am fairly certain I have this now or put myself on the road for it unintentionally. Cutting my consumption of fruits and drinking more high quality black coffee to try and address this. I have been only eating 1 meal daily for some time. I notice that I will go lower in bgs than the day before. Examples 96 yesterday before my only meal and 79 today. Doe that mean my insulin resistance is breaking? It’s taken about 3 months to get to this point. Morning fasting numbers around 103-114. Ok, did I miss it. ? Can we reverse a fatty liver ? Thanks, read the notes now. I was told that eating a Keto diet causes fatty liver in older women. This sounds like it doesn’t. Does a high fat diet cause fatty liver while eating low carbs?